I was having a nice afternoon, I had some things to do this morning and then an appointment. I came home, had a nap and ate lunch... I then made the mistake of reading some news and stumbled on this and now I am so angry I could cry. How have we gone so backwards in human rights? It was not that long ago that people were being hung from trees in the United States for the colour of their skin, something that can not be changed even if anyone wanted to. Why do people care so much about who other people want to love? It is just as unchangeable. I wish I could have controlled who I have fallen in love with over the years. I assure you the amount of heartbreaks would have been a bare minimum if I could have. But you can't control those things. I am baffled and broken hearted that people still, in 2014, feel there is a superior position to be in when it comes to the human race. I don't have a vast amount of gay or lesbian friends, but I have a few. Wanna know something crazy..they are some of the kindest people I know. They work hard, love each other deeply and live by a rule of giving more than they take. They are great to their children and generous to others. Wanna know who else I know. Heterosexual people who are complete assholes. I know ones (who I am not friends with, I only know through volunteer positions I have served in with youth and young children) who are godawful parents, who only think of themselves when it comes to their kids. I know men who hit their wives and cheat on them regularly. I know women who neglect their children and are awful to others. Why would they be served in these Arizona stores yet my two friends who happen to be women who love each other not be? I am saddened and disgusted that we are still fighting this fight. I am in charge of 4 young children and I promise they will not be raised to believe such things about others. They will take less then they give and they will believe, and do believe, that all people are equal. How can this be allowed? How can this all be under the umbrella of "Gods Will?" I don't know God, I have never met him. I have had numerous one sided conversations with him on many occasions in my life. From my experience he is not a big talker, how can people believe this is his will? I had spent over 10 years of my life trying to communicate with him and not once did I ever get any sort of explicit instructions about anything let alone how detailed my hate should be towards a certain group of people. We can do better than this. We have to do better than this. I am disgusted with you Arizona. Completely and entirely. I am grateful I have children. I wish I had more..so I can teach them how to love others and when I am dead they can make the world a better place for everyone. Why are the loudest voices always the dumbest? I am grateful for the second nap I am going to take before work so I can cool off. I am grateful for the belief I have that the good will always win over the evil. Hate will never win over Love and it will always get better. What a glorious weekend! 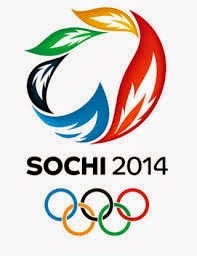 The kids and I woke up at 4:30am Sunday morning to watch the Hockey game and cheer on our boys to Olympic Gold! It was fun watching them get excited and feel the pride that I feel. I am not exactly sure how you raise children to feel pride about their country, but I think this is a good start. 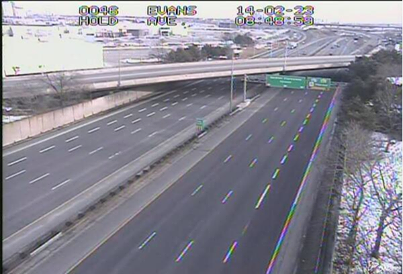 This is a real picture of one of Toronto's busiest roads during the hockey game.... in case you didn't believe how much Canadian's love hockey! Well done Team Canada!! We are so very proud of you all! To start off this week right, I found a good song for you. I am grateful to live in the True North. I am grateful for fresh coffee. I am grateful for sleep in day. Spider-Man Is My New Favorite Superhero!! 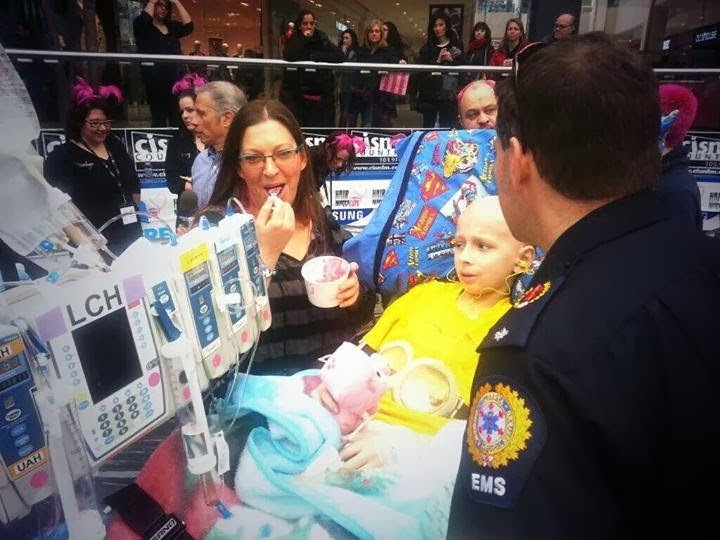 The other day while at the Hair Massacure I came up with an idea, I decided I wanted to find a Spider-Man in Calgary to go visit my friend Amy's son Austin. Austin has been in and out of hospital for most of his little life due to Epilepsy. Their family has been through so much these last few months (Her mother is Rita, my old basketball coach who was terribly ill last month and is much better now) but just days after she return home from the hospital, Austin was admitted due to his seizures. I wanted to do something special for Austin and for the whole family. I struggle living so far away during times like these, I want to help and this was one way I thought I might be able to. I often come up with some pretty crazy ideas, some work out, some fail miserably. I wasn't exactly sure how this one would go over. I worried it might be a tall order to find a grown man (who is a total stranger) willing to dress up as a comic book hero to go visit a child he doesn't know out of the goodness of his heart. So I sent out a simple tweet, and within a few hours I was well on my way to finding a superhero. Among the many retweets and messages I received I got an offer from a man willing to dress up as Captain America and one willing to go as Professor X, there was even an Iron Man....which were all wonderful offers, but Austins favorite is Spider-Man, I needed Spidy. Then it came! I got a DM from someone on twitter saying he knew a guy who lived in Calgary and would do it! He gave me his phone number and I hesitantly phoned him, not sure what he might say.."Hi..I got your number from a stranger on twitter wanna dress up in Spandex for me?" but he was really sweet, we chatted for over an hour about Austin and life. Turns out he is a Fire Fighter for the city of Calgary and just a overall fantastic man. The time and date were a little up in the air because no one was sure if Austin would be okay enough for a visit soon and if he would get moved out of the ICU... but thankfully things worked out and at 3 pm today, Austin (and his brothers) got his visit from the friendly neighborhood Spider-Man. It was such a great day. Thank you Steve, for your willingness to help out a complete stranger and for bringing a smile to three little boys faces. You are good stuff. I owe ya! I am grateful, yet again, for people who bring happiness selflessly. I am grateful for spandex suits and the joy they bring...everyone. I am grateful for the friends I have and for the deep love we have for each other. Today at work Rob announced that he and his beautiful wife Steph are going to have a baby. I could not me more excited for them! I cried a little when we played the babies heartbeat on air.. I brought in my doppler from my Doula equipment and they let me find the heartbeat to play when they shared the news over the radio. I am so excited for my friends! I am so happy there is going to be a few babies at work in the next few months. I will get to love and hold babies...it's going to be such a wonderful summer! Rob & Steph are due in July! I am grateful that I get to share this exciting time of babies, and not be the one up every few hours at night feeding it! I am grateful for pretty red finger nails. I had them done last week and they make me feel beautiful. I am grateful for a job I love and for how much fun I have day to day. Such A Beautiful Day To Shave Your Head. I'll admit something, I have been a tad self absorbed these last few days. I have felt a little sorry for myself not having anyone special to spend this weekend with. I had a pity party for myself when my plans to go to Calgary fell through because of my stupid van, and I was not able to spend some much needed time with my friends. I was having a bit of a "poor me" moment when I realized that I was not even going to have anyone to have dinner with tonight. Then I remembered today was the Hair Massacure at West Edmonton Mall. So I got dressed and headed in to watch and support my co-worker Fitzy with his friend Aaron. Fitzy has been helping raise money for Aaron the last few months, a little boy who has cancer and one of his last wishes was to help raise money for the organizations that did so much for him during his battle with Cancer. Aaron with his mom at the hair Massacure. Kim donated her hair for wigs too. I am not exactly sure what I was expecting when I go there, but let me share with you what I experienced. It never ceases to amaze me the ability a few people have when they decided to work together to accomplish something. The whole place was filled with pink haired people raising money for cancer research, which was sensational. There were Football players, and news people there, everyone was smiling and happy and feeling so good about the money raised to go towards such a noble cause. But what moved me the most was two little girls. These two little girls not only raised money, but both of these children also decided to shave their heads, but not just shave their heads, these brave and valiant little women donated their beautiful hair so it could be made into wigs so other children with cancer could have hair to wear during their treatment. It was all I could do to not burst into tears while I watched these girls allow their locks to be put in tiny ponytails and cut off. Not once did either of these girls frown, cry or have a second thought. They just sat there, smiling while this selfless offering was made. I have not felt so much shame and so much joy at one time in my life. I know I would never have been so brave and selfless, nor am I now. But the joy I felt thinking these are the children my kids will grow up with made me feel so full of happiness that I could have literally burst. As parents all we ever hope for is that our children will give more than they take, and that they will do good with the time they are given. And it warmed my heart to see there is another generation of people who care about others more than they care about themselves. This was hands down the best way to spend Valentines Day I could have ever thought of. It was a good and happy day. I treasure days like this, they humble me and remind me what I have to be grateful for. I even found a special friend for Austin, My dear friend Amy's son who is still in Hospital in Calgary... Austin, Spider-Man says Hi!! When I sent him this picture, I was sent this from Karie and Jamie (my dear friends) who are with him tonight in hospital so his parents can go out on a date! ...Austin awake and Smiling.... Best.Gift.EVER! I am grateful. So very grateful. I am grateful when I am reminded that people are wonderful and that there is still so very much to believe in. This Valentines day I am absolutely being the stereotypical single woman. Single woman pretending to be okay with being alone on this obnoxious day. I just went to a Miles Teller movie at the theater, alone, because I have a huge crush on him. I wore my sweat pants and a baggy sweat shirt there too. I am grateful my van is finally fixed. I am grateful for celebrities who resemble the hot surveying guy I met this past summer from Calgary, so I can unashamedly stare at him for over an hour and it not be considered stalking. I am grateful this wretched month of February is almost over. Ooh how I love the Olympics. I love everything about the games. I think I enjoy the Olympics more than I enjoy Christmas. I get this warm feeling in my chest and I am brought to tears every time I watch people win medals (not just the Canadian athletes either). I love cheering and I love how there is this surge of national pride around this time. It's so special. The stories of athletes and coaches helping others, true sportsmanship and the thrill of competition always put me in a good mood. I find myself waking up earlier than normal and before I even get out of bed I'm checking the Olympic highlights from the events. Ooh how I love the Olympics. One day I hope to get to go see them live and cheer for our athletes! I am grateful for working pens. I am grateful for days off to get to see friends. WHY CAN I NOT REMEMBER TO DO TOOTH FAIRY DUTIES?????!!!!!! In this house the tooth fairy is a total chump. She never, and I mean NEVER, seems to remember to leave something for the ridiculously excited child. Apparently she runs on wifi here and the signal is weak to nonexistent. I can talk with the child with the loose tooth all through dinner about how hard it is to eat with it so wiggly, laugh about eating an apple for dessert to try and help get it out. I can sit beside the same swaying toothed child during a movie after dinner and even wiggle it with my own finger. I can EVEN pull the frigging thing out with my own fingers to help her get it out finally...and then STILL forget to do Tooth fairy jobs after. It's not like the Fairy is over worked, she only works a few days in her whole life... Sigh... I'd say can her! Luckily for me she is union, making it almost impossible to fire her. Honestly, I should have to take a competency test yearly to maintain some sort of license to be allowed to have children. Thank goodness I only forget trivial things like this. Things that will scar them for life and force them to grow up too quickly by stealing their naive and innocent beliefs in magical things. Phew...really dodged a bullet there. 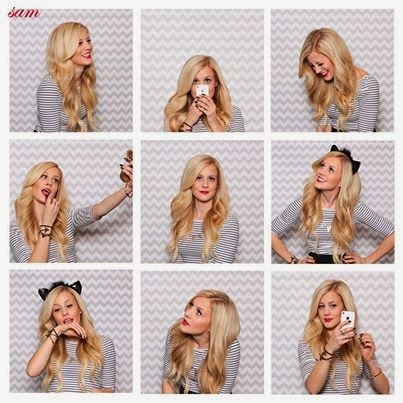 I am grateful for sarcasm and laughter and the ability to not take myself too seriously. I am grateful for my kids being at the age where sports are becoming a bigger part of their lives. This part of parenting is what I have been so excited for!!! I love that my children love sports and competition. I love watching them play and I love that they seem to pick up athletic things so naturally and easily. I am grateful for my friends down in Calgary that keep me informed about whats going on when there is a problem. I miss you guys terribly and appreciate that you keep me in the loop. I have always had short hair. I only remember two maybe three times in my entire life when my hair was what I would consider long. Long for me is when it's closer to my jaw and maybe a little past my jaw. I hate when my hair is long. Even when my hair was longer I would always wear it up off my face. I find long hair hard to take care of. I have a little bit of curl to it too, so the longer my hair, the more time i had to spend on it in the morning. I have always preferred short hair for myself, I feel more confident when I have short hair. The times when I have had longer hair it has always been when I feel the worst about myself. Longer hair for me is when I am feeling self conscious and unhappy. I have learned that I should never make any major life decisions when my hair is long. That might sound ridiculous, but it is very true. When I have long hair it is more often than not, to please someone else. Long hair is something I hid behind. I read the other day a few articles written by men, rather narrow minded men, suggesting that women who have short hair are somehow lacking in femininity, are "damaged" and/or are lesbians or queer. He believed by having short hair it was a rebellion towards men and how it didn't look as good as long hair does, ever. Really? One of the articles also went on to say that when other women encourage a friend to cut her hair short it is somehow an attempt to make themselves go up in points by sabotaging a fellow sister to look worse. This could not possibly be true. This is clearly just the ramblings of a man just being awful about women. Surly this is not how most men feel. I am genuinely interested in hearing from women, do you prefer yourself with long or short hair and more importantly HOW DO YOU FEEL when your hair is long and when your hair is short. I am so curious to hear from you. All natural, medium length for me. I am grateful for good hair products. I am grateful for pizza night.